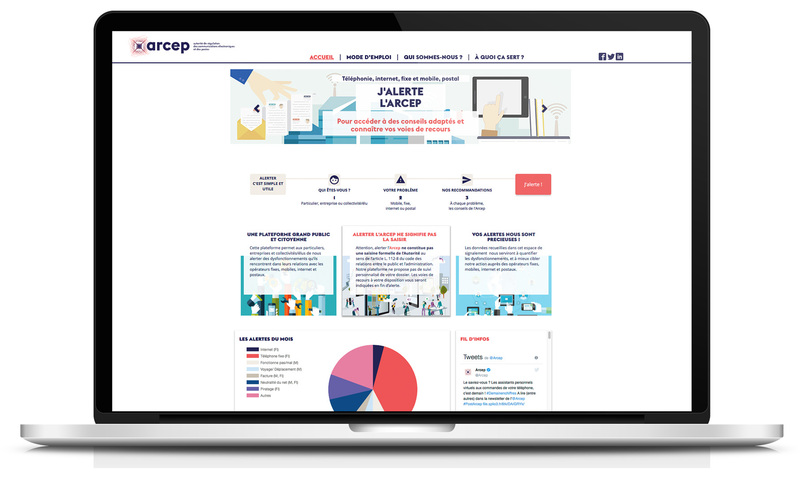 Paris, 17 October 2017: Today Arcep is launching a reporting platform that allows anyone, be they an individual, elected official, business or local authority, to report any malfunction encountered in their relationship with their ISP, fixed or mobile telecoms operator, mail or parcel postal operator. For Arcep , the reports gathered through this platform will enable it to track the problems encountered by users in real time. It will be able to draw on recurrent malfunctions, and detect both spikes in user alerts and weak signals to target its actions, and to be more effective in its regulatory actions aimed at operators. Arcep is shifting from an approach of simply gathering consumer complaints to one of reporting-based civic acts, to achieve data-driven regulation that will enable the Authority to devise systemic responses that improve the way the sector works. "J'alerte l'Arcep" and the "Mon réseau mobile" (My mobile network) site, which was also launched in 2017, are two tools in a more wide-reaching strategy for modernising regulation. Arcep's actions are part of a State-as-a-platform approach : working to be agile, to unleash innovation, provide open access to data, encourage third parties to make use of that data and extract new value from them. Fuelled by the conviction that, to be able to meet its responsibilities, Arcep needs to have its finger on the pulse of fixed, mobile and postal network users' experience, to be able to detect weak signals and inform these users in the most clear and transparent fashion possible, so that every citizen becomes a micro-regulator. This is the aim of data-driven regulation: a new form of action that comes to complete the regulator's traditional toolkit. The guiding principle is to harness the power of information to steer the market in the right direction. At a time when people in France expect high standards from their connectivity, these tools can naturally be further improved, and they are intended to become steadily better over time. Laying the groundwork for Arcep's transition to a platform, they are already invaluable instruments for guiding regulation.